A number of different codes and standards for thermal insulation are related to fire safety—ASTM E84, ASTM E136, ASTM E119, and UL 1790, as well as regulations about fire penetration seals, grease ducts, and so forth. It can seem a maze of confusing standards to those who do not spend much time dealing with fire safety. It makes one wonder whether there need to be so many, and whether there is overlap. What needs to be specified when one simply wants thermal insulation that will not catch on fire, release smoke and toxic fumes, and harm people? In February 2003, a fire broke out at the Station Night Club in West Warwick, Rhode Island. One hundred people died—most from fire injury, smoke inhalation, or being trampled. Many news stories at the time reported that the acoustical insulation caught fire from the band’s pyrotechnics, and the fire spread so quickly that people did not have time to escape. The subsequent investigation revealed that the soundproofing consisted of exposed foam insulation containing no flame retardants. Was this simply a case of some construction manager not reading the fine print on a box of foam insulation? Why did this happen when there are codes and standards to address this sort of thing? There were numerous fire code violations involved in the Station Night Club disaster that this article will not address. To those of us who work with thermal and acoustical insulation, however, it seems basic that exposed insulation material should meet the building code requirements of at least being rated 25/50 by ASTM E84, which translates to a Flame Spread Rating of 25 or less and a Smoke Developed Rating of 50 or less in the so-called Tunnel Test. When the insulation consists of an organic material, such as a foam, it should contain fire-retardant chemicals. If the soundproofing insulation at the Station Night Club had been rated 25/50 and thereby met the building code requirements, the disaster may well have been prevented. 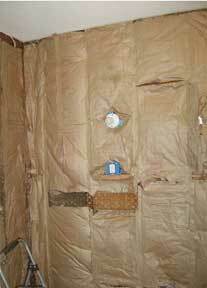 Building insulation is normally not exposed once construction is complete. Figure 1 shows wall insulation that has yet to be covered with drywall. This insulation material does not have to be rated as 25/50 because after it is covered with drywall, the assembly will be 25/50 and will meet other building fire codes. By contrast, Figure 2 shows metal building insulation that is exposed at all times. This insulation has a vapor retarder facing that, in combination with the insulation and adhesive, must be rated 25/50. In fairness, ASTM E84 and a 25/50 flame/smoke rating would not necessarily accurately predict what a particular insulation material exposed to the pyrotechnics at the Station Night Club that night will do. 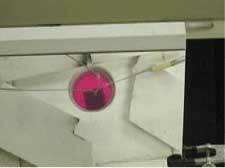 E84 is a laboratory test conducted in a “tunnel” with the material installed upside down (as in a ceiling configuration). A flame is started, air is blown down the tunnel at 240 feet per minute, and the rate of flame propagation and quantity of smoke released are measured. The ratings are both relative to cement board (0 flame spread and 0 smoke developed) and red oak (100 flame spread and 100 smoke developed). While results of a laboratory test may not match events in a real-world setting, if the soundproofing insulation at the Station Night Club had met the building code requirements by having a 25/50 rating, the fire likely would have spread more slowly or not at all, giving music fans time to escape. Pipe and duct insulation installed within a building is unlike wall and ceiling insulation that is flat and continuous over a large area. Pipe and duct insulations are often located above a suspended ceiling in an area that acts as a plenum (for air distribution). In the case of insulation on water pipes above a suspended ceiling that acts as a plenum (for air distribution), a fire could be become much worse if the insulation material were to spread the fire quickly and release a large quantity of smoke. Thus, the pipe insulation above a suspended ceiling that acts as a plenum should be 25/50 flame/smoke rated and is typically specified as such. 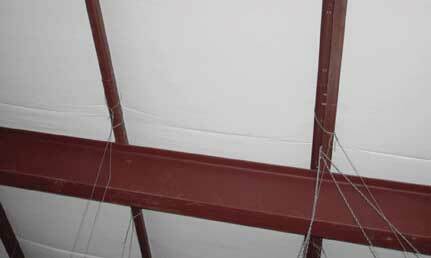 However, areas above a suspended ceiling are often but not always a plenum. Figure 3 shows an application of factory jacketed pipe insulation that is a 25/50 flame/smoke–rated material. Incidentally, all duct insulation within a building interior should be 25/50 flame/smoke rated regardless of whether the space above the ceiling acts as a return air plenum or not. ASTM E136 is used to classify a material (not necessarily thermal insulation) as “non-combustible” (sometimes the similar standards ISO 1182 or U.S. Coast Guard 164.109 are used). The adjective “non-combustible” is actually more stringent than it sounds. “Non-combustible” means the material will not support a fire, and when exposed to the temperature of a fire high enough to thermally decompose organics into gases, these gases will not appreciably feed that fire. The requirement that a material be rated “non-combustible” is not always specified for building construction materials. It is commonly specified for applications in confined spaces, such as on ships, or for high-temperature industrial applications with flammable fluids, such as petrochemical facilities where there is constant danger of fire from leaking flammable fluids. The E136 test itself does not appear related to the reality of a fire. A small sample is inserted into a small furnace that has been preheated to 1,382° F (750° C). To be rated “non-combustible,” several conditions must be met: no flame must be observed for 30 seconds; the measured temperature of the sample’s center must not increase by more than 54° F (30° C); and, after the test is complete, the sample must not have lost more than half its weight. Figures 3 and 4 show two different samples: one that meets the requirements for being “non-combustible” and the other that does not (hence a rating of “combustible”). For a material to be rated “non-combustible,” it must have a relatively low organic content, around 0.10 pounds per cubic foot of material volume or less. With fire endurance testing of a mechanical insulation system, the goal is to demonstrate that the system will protect a particular pipe or piece of equipment from heating up too quickly. Since thermal insulation only reduces the rate of heat transfer, rather than stopping it, greater thickness for a particular material generally offers protection for a longer period—but not forever. 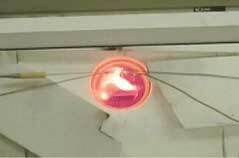 Of course, the insulation material must be able to withstand the fire temperature itself, generally around 2,000°F. Two commonly specified standard time–temperature fire tests are used: ASTM E119 and UL 1709. The curves for both are shown in Figure 5. The ASTM E119 fire test is used primarily for building construction, and the time–temperature curve more or less represents that of a cellulosic-type fire. For example, certain types of insulation in certain thicknesses are used to prevent fire from spreading from one building floor to the next. The tests to qualify the particular construction are frequently run following the ASTM E119 fire cure. In Figure 5, the fire starts at room temperature (75°F in this case) and gradually increases to 2,000°F in 4 hours. By contrast, the UL 1709 fire curve represents a much more severe fire, in this case a hydrocarbon fire (such as might occur at a petrochemical facility), which increases from 75°F to 2,000°F in 5 minutes. In addition (not shown in Figure 5), the fire must generate a minimum quantity of heat—65,000 Btu/hr, a truly intense fire. The objective of the insulation is to prevent the insulated pipe or equipment from reaching 1,000°F for a minimum period of time, typically 30, 60, or 180 minutes, depending on the requirements. The results of this test depend not only on the insulation thickness and characteristics, but also on the characteristics of protective jacketing and of the pipe or equipment being insulated. For example, for a given insulation system, pipe diameter, and type of steel, it will take longer for a thick steel pipe to reach 1,000°F than for a thin steel pipe to do so, simply because the thick piece has greater thermal mass. As with many technical issues, “the devil is in the details.” And with time–temperature fire-rating tests, the details are extremely important. Mechanical insulation is sometimes used as a firestopping material where a pipe passes through a wall. The objective is to prevent passage of fire from one side of the wall to the other. Since the pipe is likely insulated anyway for energy efficiency, condensation control, or both, that same material may meet the firestopping standards required by code for the project. This insulation essentially prevents the fire’s spread through the annular space between the pipe and the wall. In building construction, the ASTM E119 time–temperature test described above would be used. The wall thickness, pipe size and type, and insulation thickness and type are important variables. Sometimes a combination of insulation materials is employed to meet the requirements. In industrial applications, pipe penetrations also need to be fire rated. If the combustibles of concern are hydrocarbon liquids, then the fire curve employed would be UL 1709. If they are simply cellulosic materials, the ASTM E119 curve would be used for the system test. 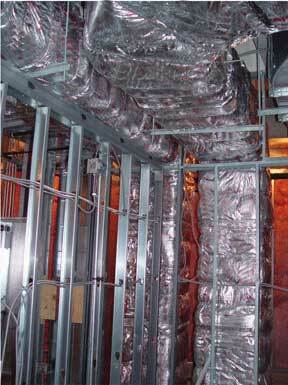 Insulation of grease ducts, used as exhaust ducts above commercial kitchens, is a special case. The outsides of the ducts are insulated with a material with a high maximum-use temperature. The objective of the insulation is to prevent the building materials near the ducts from catching fire when the built-up grease in the ducts catches fire (which it eventually will; this is not considered a disaster, but an inevitable event). The time–temperature curve used in the internal grease duct test likewise is unique. Typically, with the duct surrounded by ambient air, the air inside the duct is heated to 500°F for 4 hours, during which time the temperature at the surface of the duct at its midpoint must not exceed 117°F above ambient temperature (e.g., if the ambient temperature is 75°F, the maximum allowable internal temperature during this time is 75 + 117 = 192°F). The temperature is then increased to 2,000°F for 30 minutes. The insulation’s external temperature is not allowed to increase by more than 325°F during this time or at any one point, or by an average of over 250°F. Several different tests for fire safety exist that involve thermal insulation materials. Some are specific to mechanical insulation. While not everyone needs to be a fire safety expert, it is useful for those who deal with mechanical insulation to have a cursory knowledge of what the tests are, how they differ, and why and when they are specified. For a material to be qualified to a particular fire safety performance, it must be tested. Sometimes, the configuration and conditions of the test are critical to its results. Everyone needs to pay attention to those details. Wall insulation with Kraft facing, prior to installation of drywall. Since it will be covered with drywall, the insulation itself is typically not required to meet a 25/50 Flame Spread and Smoke Developed Rating. With Kraft facing, it typically does not. Metal building insulation with exposed facing that is rated Class A per ASTM E84. Tests on an insulation material rated “non-combustible.” The photo was taken 35 seconds after the sample was inserted into the 750°C furnace. Note that the sample is not in flames. Tests on an insulation material rated “combustible.” The photo was taken 35 seconds after the sample was inserted into the 750°C furnace. Note that the sample is in flames. 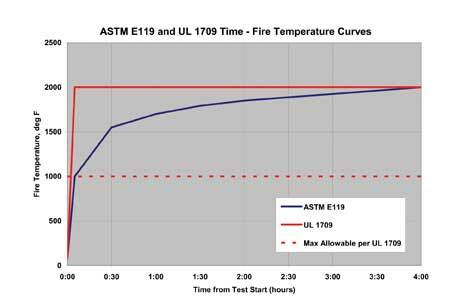 ASTM E119 and UL 1709 time–temperature fire curves. Grease ducts can be effectively insulated with specially designed and tested high-temperature-rated insulation systems.